A twisty Parisian thriller that explores victimization and vengeance. Dutch director Paul Verhoeven—who brought us RoboCop, Total Recall, and Hollow Man—delivers his creepiest since 1992's Basic Instinct. 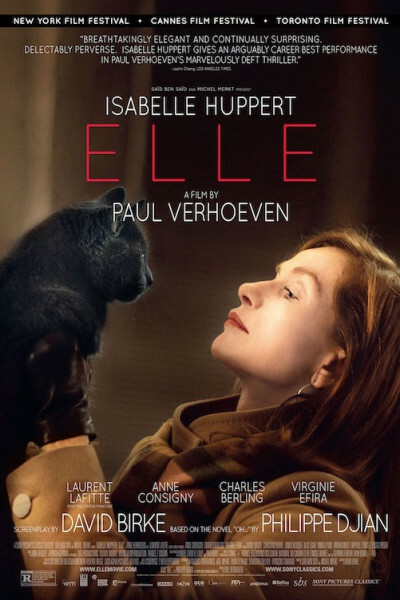 The real and literal star, of course, is "France's Meryl Streep," Isabelle Huppert. She acts by not acting. It's amazing because it's invisible and effortless, like close-up magic. Laurent Lafitte, as Patrick, is very interesting, if for no other reason than being Jake Tapper's clone. It's weird. Really weird. Like doppelgänger weird. So weird, in fact, that I'm kinda wondering if Elle is what Tapper did after leaving ABC and before joining CNN. Yeah, that's the ticket. Alas, I cannot recommend the film. In the end, it's simply too much. Way too much.